John Burkhauser is currently employed at BOLT ON TECHNOLOGY as the Director of Education, a job that allows him to use a lifetime of learning experience day in and day out. John dreamed of being a meteorologist but found out college wasn’t for him. When his car failed the state inspection, that was the day his career was decided on. John went to Pennco Tech to attend the Auto Gas and Diesel program. After graduation, John started work in a dealership where he went from a “D” technician to an “A” technician in a few short years. He also added shop foreman to his resume. During this time, John became certified as an ASE Master Technician and Advanced Level Technician which he still maintains. Crossing to the other side of service, he became a service adviser winning the Ford Silver Medallion award. He then became a Service Manager for a large dealership. John also worked in the independent aftermarket. He then applied to be an instructor at a post-secondary automotive training school where he taught basic electrical and HVAC courses for the better part of ten years. Fortune would change his career path again when John learned about BOLT ON TECHNOLOGY and became part of the team. Change is tough when you are just treading water. Get your head out of the water and see what is going on around you. Being independent is great but is also a problem. If you don’t embrace change you will find yourself going in reverse or not growing at all. Stop and take a step back to see new and different ways to do things. Get outside the shop and look at other industries or companies. What are they doing? Change requires consistency to make change stick. Don’t be afraid of letting technology help change your business. John Burkauser’s previous episodes HERE. 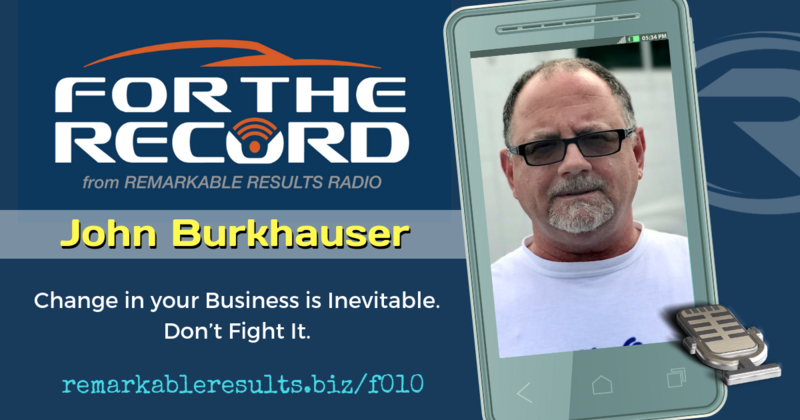 A special thanks to John Burkhauser for sharing his passion – For The Record.